Founder of (en)Visionography, leader of the New Wave of 21st Century Black and White Fine Art Photography, highly sought-after educator, experienced workshop leader, IPA Professional Architecture Photographer of the Year, World Photography Awards & Hasselblad Masters Finalist, winner of more than 80 major awards and distinctions for Black & White Fine Art Photography, author of best-selling book From Basics to Fine Art, progressive experienced architect and lover of art in all shapes and forms. A new and original concept, (en)Visionography has rapidly gained worldwide recognition in the 21st Century and more and more artists start approaching photography this way every day. In the heart of a culture that has fascinated and inspired so many artists over the centuries. A workshop where you will dive into the secrets of creativity in black and white photography, from the first sparkle of vision, all the way to advanced post-processing. Workshop highly recommended to the students who have attended my other (en)Visionography workshops, or to new students who want to take their black and white photography to the level of art. 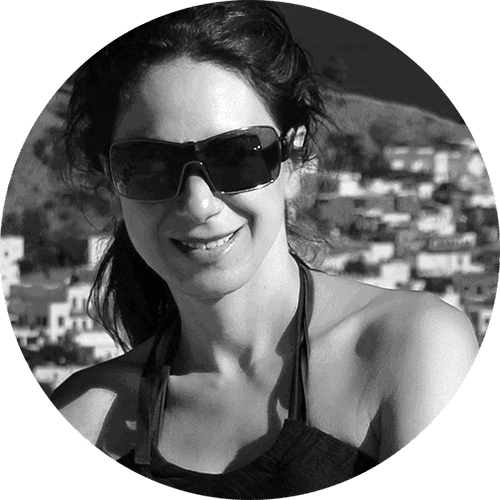 To get even more value from this course and take advantage of personal one-on-one study with Julia Anna Gospodarou for 2 more weeks after the workshop, you can choose an extra option together with the workshop: Personal Workshop Follow-Up Mentoring. See more details in the registration form. IMPORTANT: Early registration is warmly recommended. My workshops tend to sell out quite quickly. To secure your spot you will need to register and pay for the workshop in the registration form at the “Pay Now” link above. IMPORTANT: Please use an email you monitor in the registration form, so you don’t miss the workshop info. You can pay for the workshop even if you do not have a PayPal account by using your debit or credit card. To do this please choose the option “Pay with a debit or credit card” when you access the payment button. Alternatively, you can pay by bank transfer. If you prefer this option please email me at info@juliaannagospodarou.com and I will take care of everything. Julia is one of the first 21st Century artists working extensively with digital photography, after having worked for years with analogue photography, who became aware and publicly spoke in her books, articles, lectures and workshops about the need to see digital photography as a new discipline, independent from traditional analogue photography, due to the fundamental differences in the way they are experienced and created. In this workshop, Julia will delve into the depths of this new way of creating photography. She will be focusing extensively both on the aspect of conceiving an image as a deliberate artistic act and not as a random happening based only on external inspiration, as well as on the practical part of creating the final image as a result of the expression of the artist’s vision, by using her creative and processing method for black and white photography, called Photography Drawing™, which enables the use of the processing software in a way that gives the artist total control and total freedom of creation. She will share with the students the secrets of creating the recognizable three-dimensional dark and atmospheric style of her black and white architectural images, where every image tells a story, and every object is a symbol and a character in that story, like characters in a play, style that has been an example followed by many photographers over the years, bringing them recognition, awards and a career in fine art photography. Julia believes that every artist has their own artistic uniqueness and that by using the right tools they can become authentic outstanding artists. She will share her practical guidelines as an effective method that will give the students a roadmap to walk this path that leads to a successful life as an artist photographer in the digital world. I believe photography is an art. I believe the vision of the artist is what gives birth to his or her work. I believe art can help us reach the essence of life. This is what you will learn to create in Tokyo in May. Learn black and white photography, from start to finish. Discover your artistic vision, master the shooting process and become a virtuoso of black and white processing. Learn how to expand your creativity, how to make the most of it and how to find inspiration without relying only on the randomness of external inspiration – learn to find it in yourself. Learn my original, most effective method of processing PHOTOGRAPHY DRAWING™, that helped me win tens of awards and will enable you to create photography like artists do. B&W Processing does not have to be complicated. The best things are the simplest. Come, and I’ll show you how. And NO, you do not need to know how to draw, nor will you have to learn it at the workshop. What you will learn is how to think and create photography like an artist, by using the light principles used in drawing and painting. Learn how to create EMOTION and how to reach deeper into your viewers’ soul. Leave your mark in modern fine art photography. 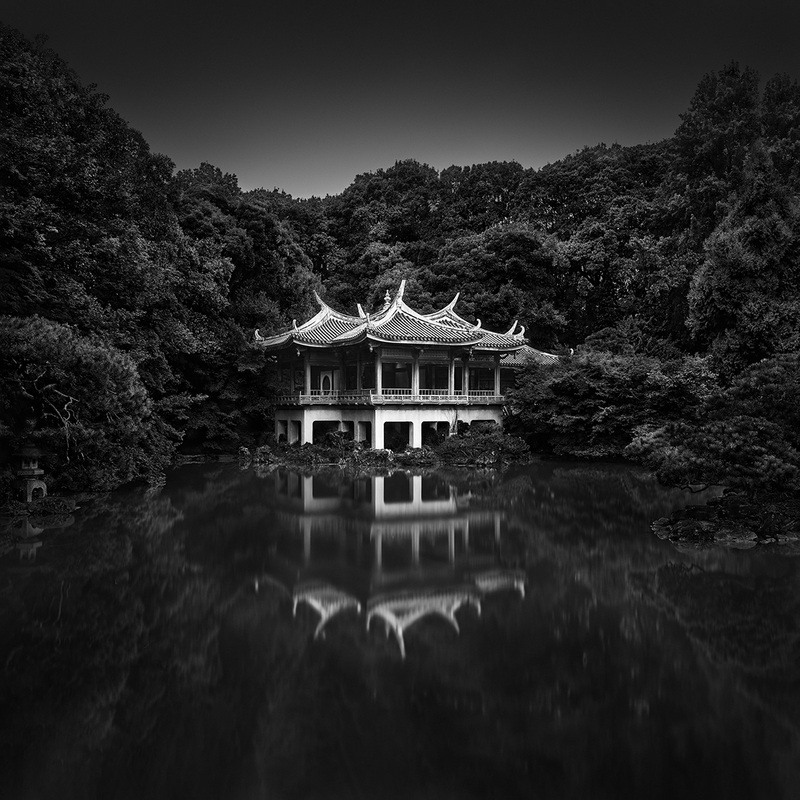 Tokyo Workshop 2019 will teach you more than just photography, it will teach you how to be an ARTIST. 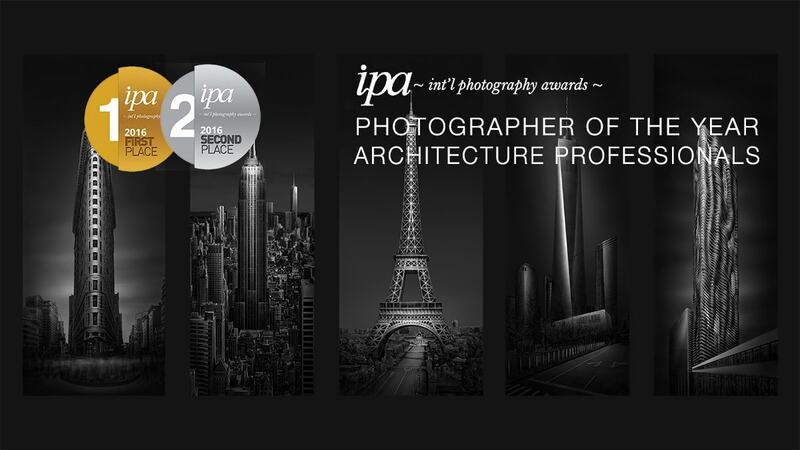 It will teach you how to turn your images into AWARD-WINNING photographs, worth being exhibited in the most exclusive fine art galleries in the world. All these skills will help you become a professional fine art photographer and be able to make a living off what you love, your photography. How to Find Your Vision and Make the Best of Your Creativity – Learn to create your photography the way artists do – by discovering and developing your vision, by understanding, stimulating and refining your creativity and by learning to control the artistic act of creating a fine art photograph. Learn to be authentic and create a unique personal style. Shooting in the field the most iconic locations of Tokyo, and hands-on instructional sessions. Learn how to shoot Long Exposure and Architecture Photography if you are a beginner, and become a master of the genre, if you are more advanced. The most iconic Tokyo locations – The shooting part of the workshop will be a special treat in itself. Among others, we will be shooting: Tokyo Forum, Tokyo Business District, Japanese Gardens, Historical Japanese Architecture, Buddhist and Shinto Temples, Tokyo Waterscapes, Tokyo Cityscapes and more. A complete list of shooting locations and the exact program will be sent to the students as we approach the workshop. We will mostly shoot architecture and landscape, but the knowledge you will acquire in this workshop can be applied to any subject, since it is based on your personal style and not necessarily on the subject. All students will receive a detailed program per day with info about the class sessions, as well as info about the locations we will be shooting, hotel recommendations, and other useful recommendations and tips for your trip. Also, I will share with you an important amount of material for study, even before the workshop, so you can be as well prepared as possible. For those who need to travel and arrange their trip to Tokyo, we will be starting the workshop on Friday, May 24th around 8:00 AM and finish on Monday, May 27th around 5:30 PM. The meeting room for the instructional sessions will be located centrally in Tokyo and I will update you as for the exact address in our further communication. The program every day will be from around 8:00 AM till around 5:00 – 5:30 PM, maybe later, depending on your resistance and willingness to shoot. All my students know that I don’t mind shooting with my students even after the workshop hours. This is going to be more than just a photography class; it will be a chance for all of us to share our passion for photography and art and interact with each other. And I love doing that. So, plan your time accordingly. With a camera, a processing software and your mind and soul, you can create real art. Proof? All my students who had amazing achievements after our work because they discovered the artist inside themselves and learned how to create art through photography. Learn how to process your images with Photography Drawing, by watching me demonstrating the method live. Learn the ins and outs of long exposure photography, from a Formatt-Hitech Ambassador, the leading ND filters producer in the world. Learn how to use a tilt-shift lens, the best lens for shooting architecture, landscapes and portraits. You do not need to own a tilt-shift lens to attend, but I will show you how to use it. 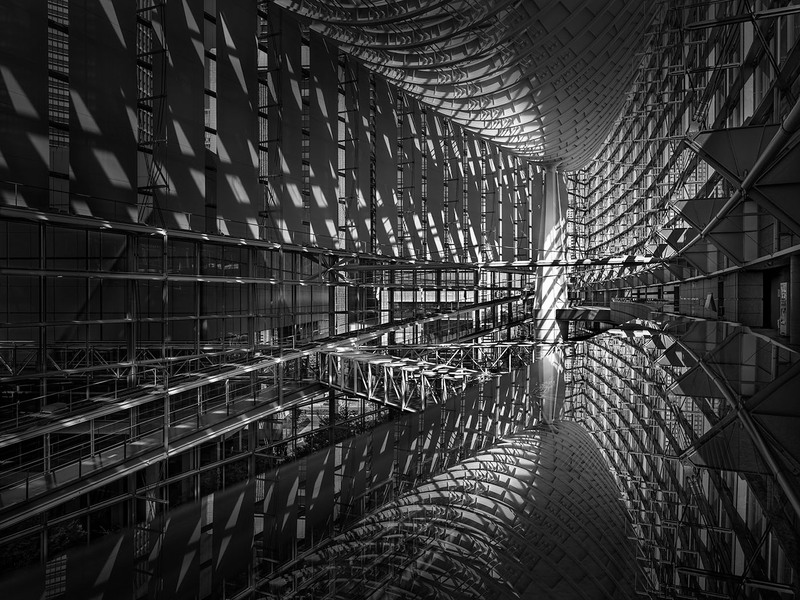 Win international fine art photography competitions, with images shot in Tokyo. First, this is a longer workshop than my standard ones – a 25% longer workshop. We will be together for 4 full days. So you will take advantage of 25% more time dedicated to studying, 25% more time dedicated to absorbing information, 25% more time dedicated to shooting iconic locations, and generally 25% more time with your instructor Julia Anna Gospodarou, which all of it means 25% more inspiration, 25% more great images and 25% more knowledge. My (en)Visionography – The New B&W Fine Art Photography workshops aim to explore the tools you can use to discover your artistic vision and create a personal style, so you can create authentic fine art photography that moves the viewer. On the other hand, my Art & Craft of B&W Processing workshops will delve more into the act of actually working on your images to put your vision into practice and create a final piece of work. This new workshop concept – The Art of Creativity in B&W Photography will take you further into the world of creating your photography like an artist, giving you the tools you need to stimulate and use your creativity better and the tools you need to turn this creativity into actual pieces of art through digital editing. If you have attended one or more of my other (en)Visionography workshops, this is the perfect workshop for you, as it is conceived to push you further into putting it all together so you can merge all the aspects of creativity, vision and black and white processing. This workshop is meant to give you the tools to discover your personal artistic voice and show you how to apply everything in your work, step-by-step and with my direct assistance. However, you do not need to have attended one of my previous workshops in order to attend this one, as we will work extensively on many important aspects of fine art photography with results that can be applied immediately even if this is your first workshop ever. 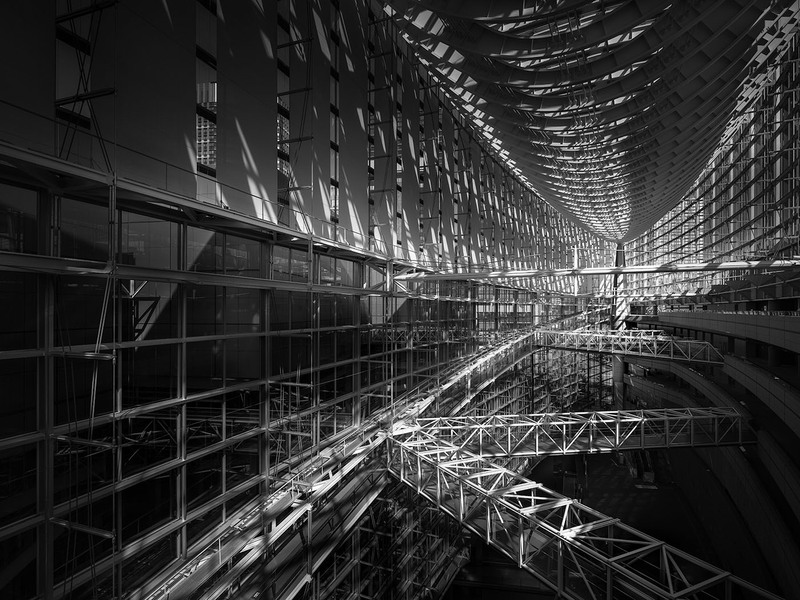 Good learning resources to prepare for this workshop are my book From Basics to Fine Art – Black and White Photography, with co-author Joel Tjintjelaar, and my video tutorial Creating (en)Visionography – Long Exposure, Architecture, Fine Art Photography. 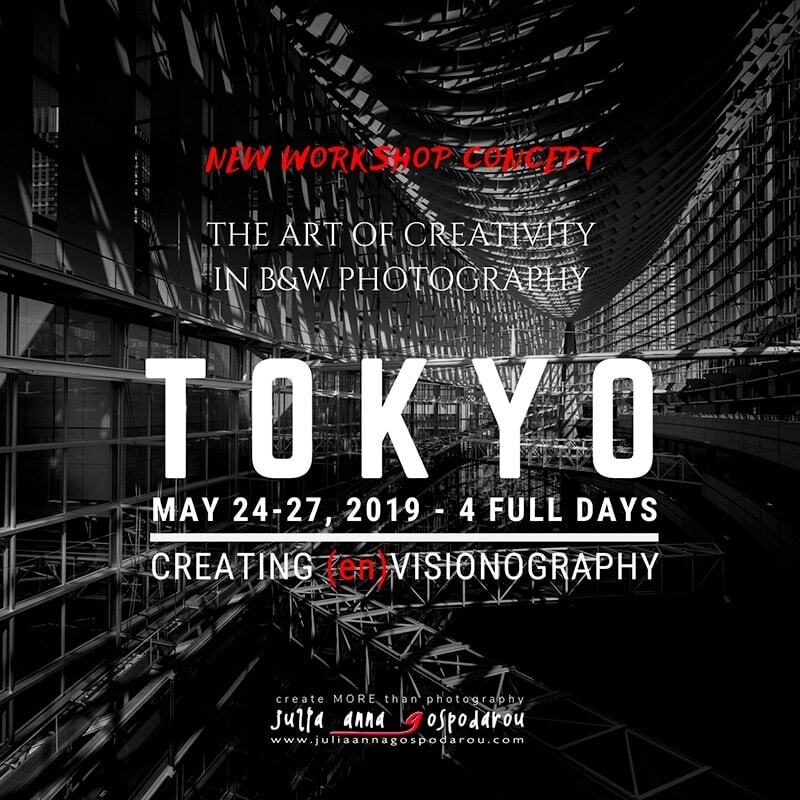 Both beginning and advanced photographers are welcome to Tokyo Workshop 2019, regardless of the gear they use or how long they are working with photography. After all, fine art, (en)Visionography, relies more on the vision of the artist than on his gear. I have won many awards using basic gear and you can do it too. A camera with Bulb function so you can shoot long exposure. If you don’t want to shoot long exposure you don’t need the bulb function, but I wouldn’t miss in your place the chance to shoot long exposure. Some newer cameras can shoot longer exposures in Manual mode too. If you on such a camera, you will not need the Bulb function. Your favorite lenses. A wide angle lens will help you and if you have a tilt-shift, you will see how good it is for shooting in the city. A cable release to control the shutter during the exposures. A laptop or notebook, with installed processing software for practicing during the instructional sessions. You can use Photoshop, Lightroom, Topaz Labs, Luminar, DxO or other software you are familiar with. For any Topaz Labs plugin or collection, you can use the code JULIAG to get 15% discount when ordering from this link. For Luminar or any other Macphun/Skylum product you can use the code JULIAG to get 10% discount when ordering from this link. Here you can find more gear and software recommendations. Choose based on your skills and style. In addition, you need love for photography and enthusiasm to express yourselves as artists. Passion and artistic aspiration are priceless in fine art photography. Theoretical presentations in the classroom. Access to conference room with high-end equipment for the presentations. Visas – The visa is exclusively the responsibility of the student and we cannot provide it or facilitate its issue. Other expenses due to events outside the organizer’s control. It is highly advisable to purchase your own insurances covering gear, health, travel and possible cancellations which are not included. There are very reasonably priced options for travel & cancellation insurance, so please make sure you have insurance before attending the workshop. We STRONGLY recommend that you purchase cancellation insurance, that will refund you if you have to cancel your trip. Travelguard.com and Worldnomads.com are good choices for this purpose or compare plans at www.quotewright.com. In the case of a cancellation, the request must be made in writing at info@juliaannagospodarou.com . A commitment fee of 30% of the value of the workshop/event fee is NON-REFUNDABLE. This fee is meant to cover the preliminary organizing and administrative costs. Refunds will be in full, (less the 30% commitment fee) if cancellation is made up to 90 days prior to the start of the workshop. NO REFUND will be made for cancellations made after the 90 days limit, unless you can find a replacement student for your spot. The workshop/course fee is event-related and CANNOT be transferred to another workshop or course. Read here the detailed Terms & Conditions . By attending the workshop you agree to these terms and conditions. Posted in Workshops. RSS 2.0 feed.